Our team fuses several laboratories from across the University of Texas at Austin and brings considerable expertise in robotics. 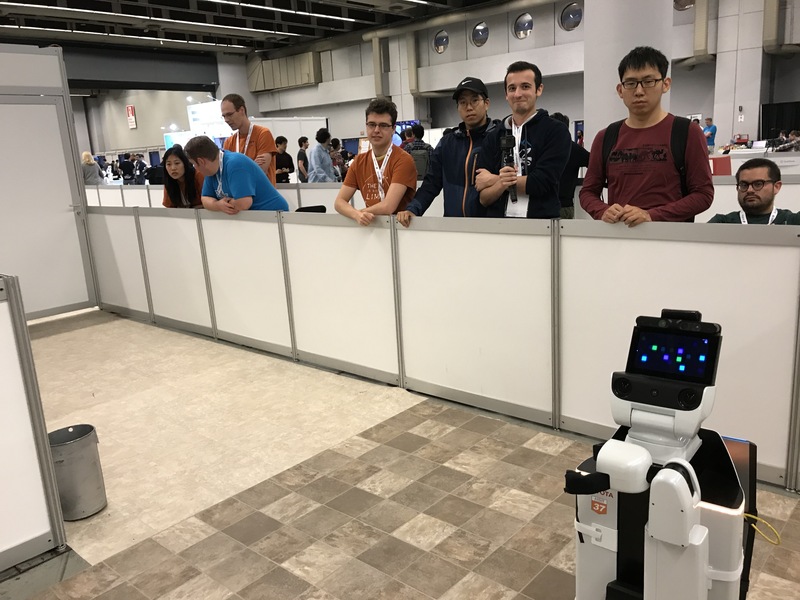 Prof. Peter Stone, the founder of the UT Austin Villa RoboCup soccer team, leads the Building-Wide Intelligence Project which explores the obstacles to deploying autonomous service robots in a building environment. Prof. Andrea Thomaz, an expert in interactive robotics, leads a laboratory focused on human-robot interaction for social robots. 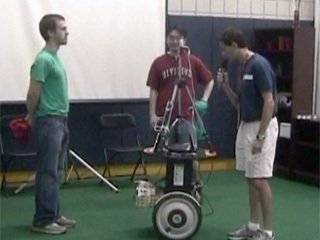 Prof. Scott Niekum, the leader of UT's Personal Robotics Robotics Laboratory, researches learning from demonstration and safety for robot learning. Prof. Luis Sentis, an expert in robotic control, leads a laboratory focused on enhancing control for robots operating near humans. Prof. Raymond Mooney leads a group with broad interests within natural-language processing and natural-language learning. 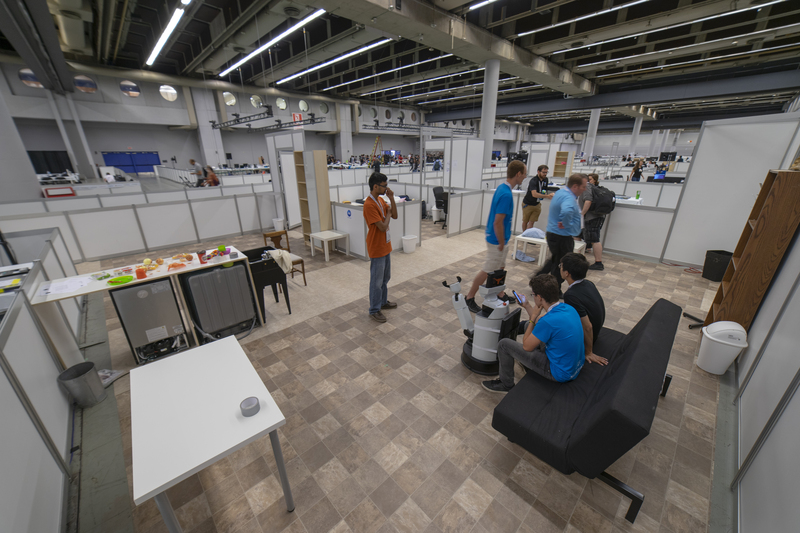 Our development efforts are situated within our ongoing Building-Wide Intelligence project, which has the long-term objective of enabling a team of robots to achieve long-term autonomy within the rich, socially interactive environment of the UT Austin Computer Science building. 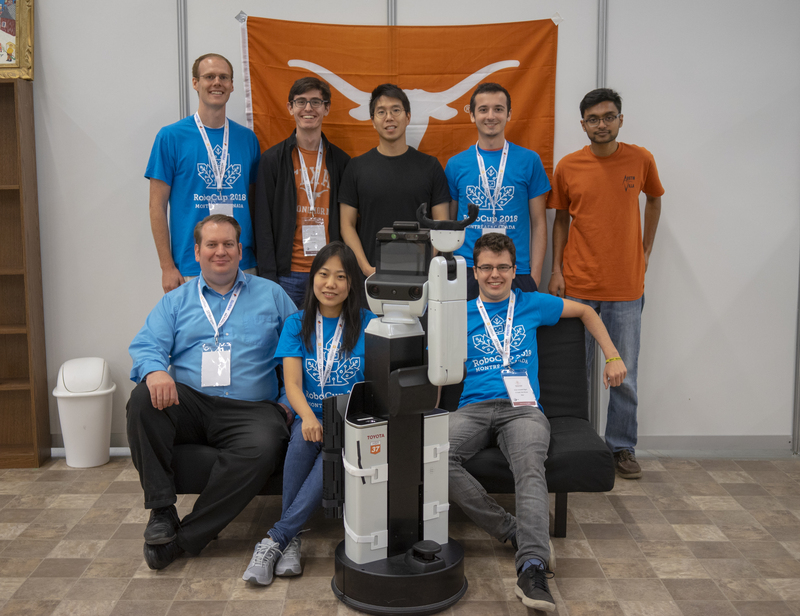 The HSR robot will thus be embedded within a multi-robot system of heterogeneous robots while its novel software is under development at UT Austin. In the '17-'18 season, we established a permanent testing arena simulating the domestic environment. Over the past two seasons, we have constructed a framework intended to act as a comprehensive domestic service robot system, spanning multiple robot platforms. As instantiated in RoboCup@Home, our goal is to develop a single system which competes in every round, rather than a suite of software tailored to each round. In the realization of this goal, we have ported our RoboCup@Home code back to the Building-Wide Intelligence (BWI) infrastructure. As instatiated in BWI, the goal of this project is to deploy a service robot in our computer science department which responds to the day-to-day needs of the building's occupants, and is considered a part of the fabric of our department. Justin W. Hart, Rishi Shah, Sean Kirmani, Nick Walker, Kathryn Baldauf, Nathan John, and Peter Stone. PRISM: Pose registration for integrated semantic mapping. In Proceedings of the 2018 IEEE/RSJ International Conference on Intelligent Robots and Systems (IROS), Madrid, Spain, October 2018. Justin W. Hart, Harel Yedidsion, Yuqian Jiang, Nick Walker, Rishi Shah, Jesse Thomason, Aishwarya Padmakumar, Rolando Fernandez, Jivko Sinapov, Raymond Mooney, and Peter Stone. PRISM: Pose registration for integrated semantic mapping. In Proceedings of the AAAI Fall Symposium on Interactive Learning in Artificial Intelligence for Human-Robot Interaction, Washington, DC, USA, October 2018. Yuqian Jiang, Nick Walker, Minkyu Kim, Nicolas Brissonneau, Daniel S. Brown, Justin W. Hart, Scott Niekum, Luis Sentis, and Peter Stone. Laair: A layered architecture for autonomous interactive robots. In Proceedings of the AAAI Fall Symposium on Reasoning and Learning in Real-World Systems for Long-Term Autonomy, Washington, DC, USA, October 2018. 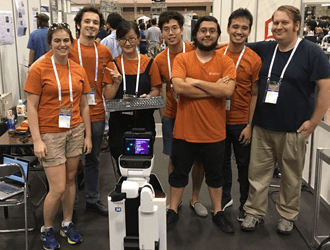 UT Austin Villa's RoboCup-related papers (from Prof. Stone's group). Relevant publications from the Building-Wide Intelligence (BWI) project. S. Niekum, S. Osentoski, C.G. Atkeson, and A.G. Barto. Online Bayesian Changepoint Detection for Articulated Motion Models. K. Hausman, S. Niekum, S. Osentoski, and G. Sukhatme. Active Articulation Model Estimation through Interactive Perception. S. Niekum, S. Osentoski, G.D. Konidaris, S. Chitta, B. Marthi, and A.G. Barto. Learning Grounded Finite-State Representations from Unstructured Demonstrations. International Journal of Robotics Research (IJRR), Vol. 34(2), pages 131-157, February 2015. S. Niekum, S. Osentoski, S. Chitta, B. Marthi, and Andrew G. Barto. Incremental Semantically Grounded Learning from Demonstration. Robotics: Science and Systems 9 (RSS), June 2013. Prof. Thomaz' relevant publications on human-robot interaction. V Chu, B Akgun, AL Thomaz. Timed Petri nets for fluent turn-taking over multimodal interaction resources in human-robot collaboration. Sonia Chernova and Andrea L. Thomaz. Robot learning from human teachers. Synthesis Lectures on Artificial Intelligence and Machine Learning, 8(3):1 121, 2014. Prof. Sentis' relevant publications on control and human-robot interaction. Prof. Mooney's relevant publications on natural language processing and natural language learning. In Proceedings of the Thirty-Second AAAI Conference on Artificial Intelligence (AAAI-18) , February 2018. In Proceedings of the 1st Annual Conference on Robot Learning (CoRL-17), 67--76, Mountain View, California, November 2017. PMLR. In Proceedings of the 15th Conference of the European Chapter of the Association for Computational Linguistics (EACL 2017), 547--557, Valencia, Spain, April 2017. The International Journal of Robotics Research, 2017. 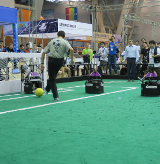 Videos from our past participation in RoboCup@Home are available at the bottom of our RoboCup@Home page. A narrated video was presented at ICRA 2008. There are many other videos from our compeitions available on the UT Austin Villa competitions page. During our participation in the RoboCup@Home SPL, we are committed to continuing our strong tradition of contributing open source code to the community. Our UT Austin Villa RoboCup 3D Simulation Base Code Release won 2nd prize in the 2016 Harting Open Source Competition. It is the basis for our team that has won 5 of the 6 competitions. Our Soccer SPL source code release, which formed the core of our 2012 SPL championship, has been widely used in the league. Our BWI code repository provides an open source suite of ROS packages, fully integrated into an architecture for service robots that operate in dynamic and unstructured human-inhabited environments. It has been built on top of the Robot Operating System (ROS) middleware framework. As of the 2018/2019 season, we have been porting back our RoboCup@Home code into the publicly available packages for BWI, and recommend going through this repository for the highest-quality versions of these packages. Our HLP-R code repository provides an open source suite of ROS packages for perception, manipulation and human-robot interaction. Our TEXPLORE code provides an open-source package for reinforcement learning on real robots. Our ar_track_alvar ROS package has become a community standard for tag-based perception. Our ROS implementation of Dynamic Movement Primitives has become a popular tool for learning from demonstration. Bayesian nonparametric skill learning from demonstration. Justin Hart, team leader. With the Learning Agents Research Group. Additionally, we will be recruiting students from the Freshman Research Initiative Autonomous Intelligent Robotics stream. We finished fifth in the RoboCup@Home DSPL competition in 2018. 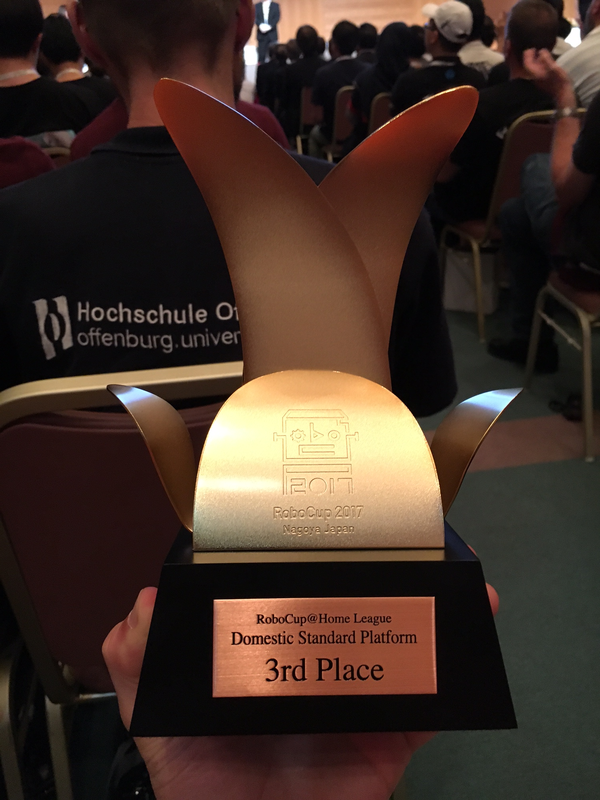 We finished third in the first-ever RoboCup@Home DSPL competition in 2017. Earlier, we won 2nd place in RoboCup@Home at RoboCup 2007. 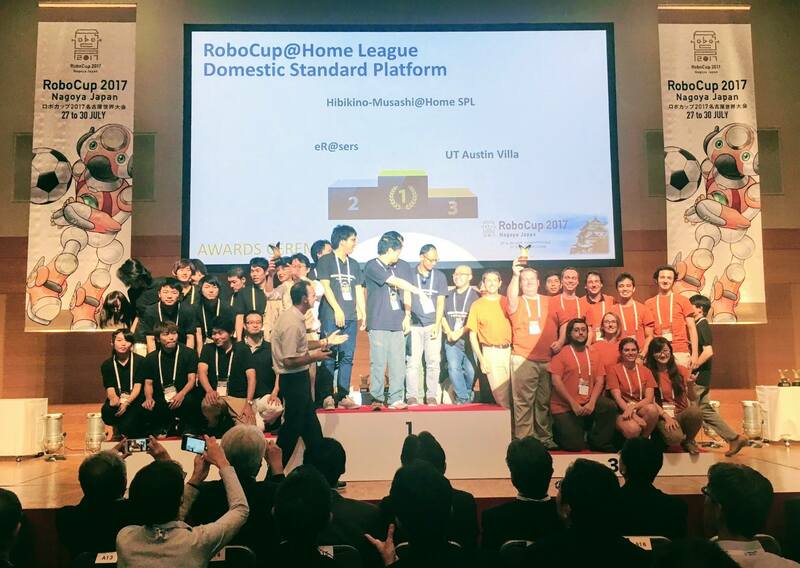 UT Austin Villa has participated successfully in past RoboCup competitions, every year since 2003.
and also in 2016, we finished 1st place in the 3D simulation league for the 5th time in 6 years.